The indigenous Hawaiians were a traditional society. Prior to the arrival of the foreign missionaries in the year 1821, they had no written language with the exception of carved stone petroglyph symbols. Despite the absence of a formal written alphabet and printed textbooks, the early Hawaiians learned by using all of their innate senses. They acquired knowledge by listening, observing, experiencing and participating. Like many other ancient civilizations, they relied primarily on the 10 fingers of their hands for counting and calculating. They saw how numbers related to everything in nature as well as the divine cosmic order of the universe. They recognized that besides having a numerical value, numbers also had mana (a spiritual significance). Using these precepts, they developed a uniquely simple yet sophisticated system of numerology based on the numerical sequence from 1 to 10. 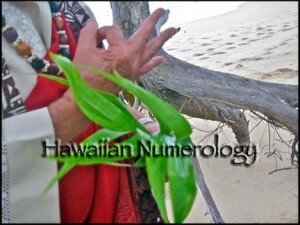 Early Hawaiian kahuna (priests) used this numerical system as a framework for analyzing, interpreting and understanding mankind’s holistic spiritual and physical relationship to all existence and the cycle of life. The following represents Hawaiian terms and designated numerical values for these numbers.